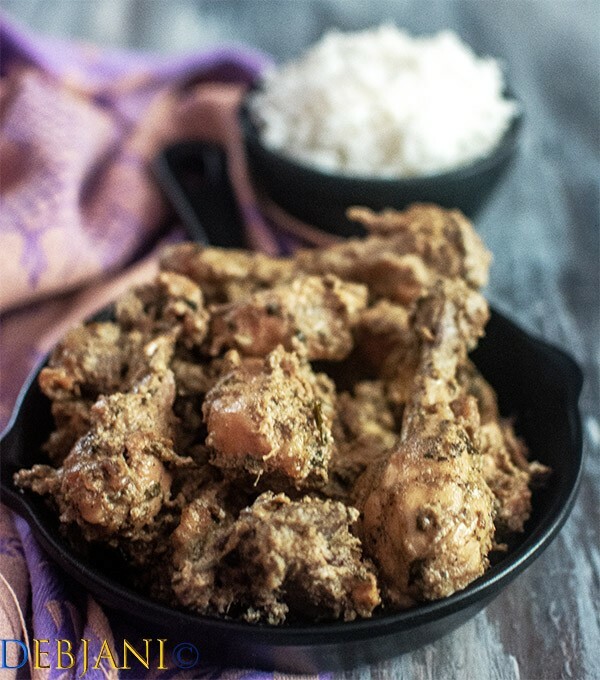 Believe me or not I was in a dilemma whether to write the recipe of Methi Murgh Malai or to write something else as part of this post! Whether to do things which I am not comfortable with! Whether to stop improving the blog every day! Another and the most important thought; whether to write whatever I like! The dilemma, however, stayed for a nanosecond, I told myself; let me not think about the things which are irrelevant to me! Let me concentrate on what I am comfortable with and most importantly what I can do with ease! I have not started the blog for popularity. This is the place where I store my food stories and here I will write what I think good for my food blog. I consider Debjanir Rannaghar as my first-born and even Pasta knows that. If I am not judgmental about Pasta; I should not be about my blog also. Once a recipe blogger; always a recipe blogger or better to say a food blogger! I have heard people saying nobody reads recipes. In fact, I have seen people saying it is networking that matters but not humble recipes to run a food blog! I even heard recipe bloggers do nothing but posting “ghisha-pita” recipes! With all these, here I am writing recipes for the last ten years without any expectations. I do write blogs out of passion and for the love of food. I have never been good with online or offline networking. However, these talks were enough for me to give second, third and fourth thought to the entire situation! Should I stop doing what I am doing or should I go ahead with what I am passionate about? A few more lines before the recipe? what say, readers? Do you mind? Well, I cooked the Methi Murgh Malai for a get together where both family and friends were present. It basically was our Bijoya Sommiloni potluck. It was a fun evening with chitchat and loads of food. I was responsible for one main course and one started. I decided to make Pomfret fry as a starter and Methi Murgh Malai was my main course. One thing I must share, I was out of time and pathetically busy at work and hence opted for these two dishes. Both the dishes involve not-so elaborate cooking and that was what I was looking for. A Punjabi neighbor of mine shared this recipe with me during our stay in Gurgaon. Auntie was quite good with cooking and used to share several useful yet easy recipes with me. My blog is having several recipes shared by her. Besan ka Sheera: A traditional yet sure shot remedy for Cough and Cold is one such recipe. As I already mentioned the cooking process of Methi Murgh Malai is not elaborate. I have marinated the chicken with Fresh cream along with Kasuri Methi, Black Pepper Powder, and Ginger and also Garlic paste for eight hours. Then there were around 30 minutes of cooking with limited spices and the dish was ready. This dosh is dominated with both cream and also Kasuri Methi and I prefer to not to use other spices. The recipe calls for no chili powder and also turmeric powder or other basic spices. I have cooked around 2 kg chicken, however, sharing the recipe for 1 kg chicken for the ease of the readers. Methi Murgh Malai is a North Indian Chicken side prepared with Kasuri Methi and Malai aka fresh cream. 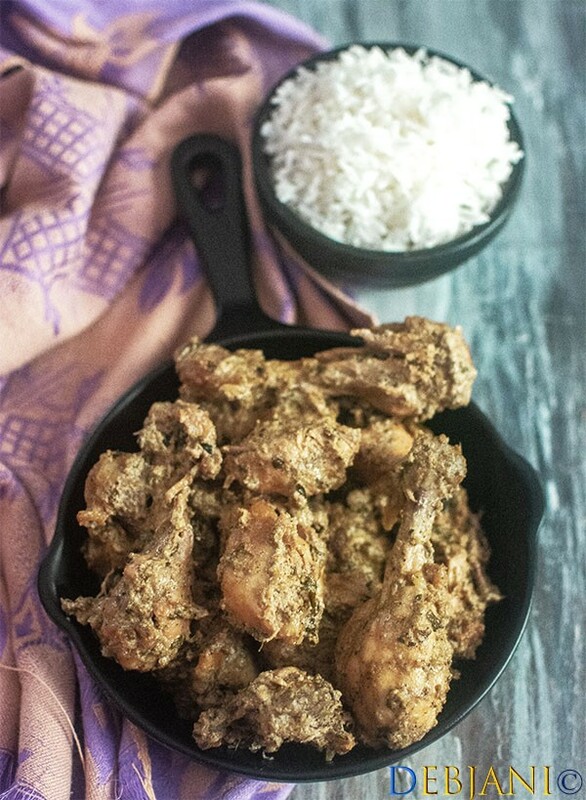 This is a semi-dry chicken preparation and goes well with Indian PAratha, Roti or Rice. Black Pepper Powder: 1 Tbsp. Wash and also pat dry the chicken chunks. Take the chicken pieces in a bowl and marinate with Single Cream, Garlic paste, Ginger paste, Kasuri Methi, and also Black Pepper Powder. Cover the bowl with a lid or cling film and refrigerate for 8 hours before cooking. While cooking; heat butter in a pan and temper the butter with Kasuri Methi. Add onion paste and cook till it turns translucent in color. Now add hung curd followed by green chilies and cook till the curd mixes. Slower the heat and cook until the butter comes from the side. At this point add marinated chicken chunks and also the remaining marinade left in the bowl to the pan. Add Salt to taste also. Now mix properly and cover the pan with a lid and cook for around 7-10 minutes. Add remaining cream and mix. Cook over the slow flame until chicken is properly cooked and there is almost no gravy. Once done, switch the flame off and serve Methi Murgh Malai hot with your choice of carbohydrate. 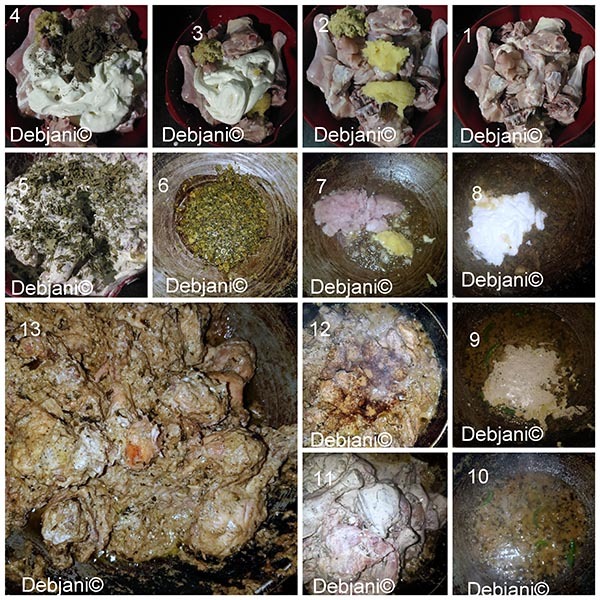 This particular preparation of chicken is semi-dry. I have used store bought single cream while making the methi murgh malai, however, you can use the cream directly from the milk. 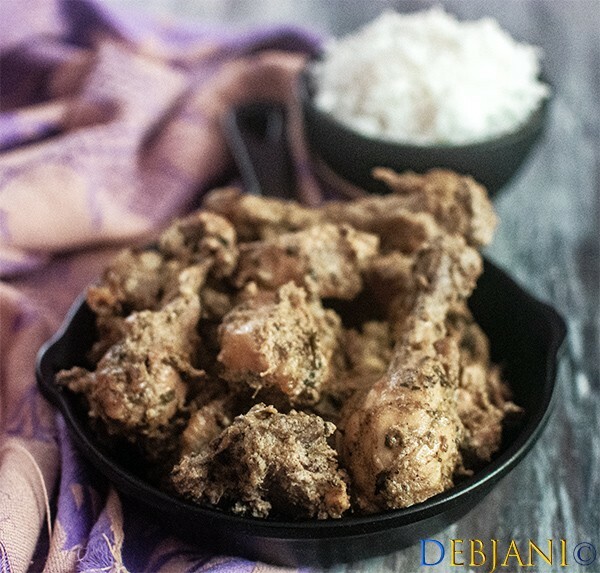 Have you tried the Methi Murgh Malai recipe from Debjanir Rannaghar!